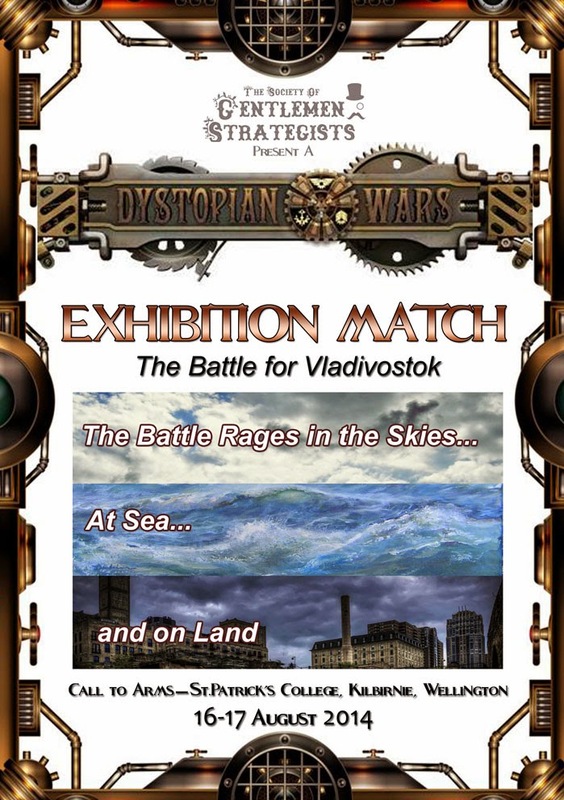 Preparations are underway to stage a Dystopian Wars Exhibition Match - The Battle for Vladivostok, showcasing the 2.0 edition of the game on land, air and at sea. This game has two sides, representing the Imperial Bond and Grand Coalition with several players commanding the forces of the Russian Coalition, Polish-Lithuanian Commonwealth, the Dominion of Canada, the Empire of the Blazing Sun, the Chinese Federation and Prussian Scandinavia. The Exhibition Match will be held at Call to Arms 2014, on 16-17 August at St Pat’s College, Kilbirnie, Wellington, New Zealand. If you're in the neighbourhood, stop by for a chat, track the progress of the combatants or simply observe the (mis)fortunes of war.